The community service work of The Amherst Club focuses on local needs. Monies raised go to worthy organizations that apply for funding to support specific projects. From its founding through 2014, the Club has raised $358,000 in contributions. The principal source of these monies has been a major annual fundraiser. In recent years, this event has been "Love Notes," a program of entertainment followed by a gala reception, which took place on or around Valentine’s Day. 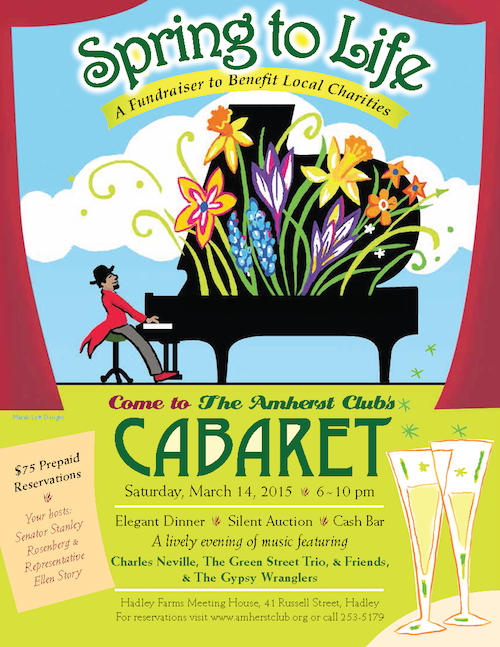 Beginning in 2015, our "Spring to Life" Cabaret takes the place of "Love Notes." For details--and reservation forms--see this year's event page.